I first learned to make homemade tamales about 7 years ago, from a sweet elderly woman in Puebla, Mexico. 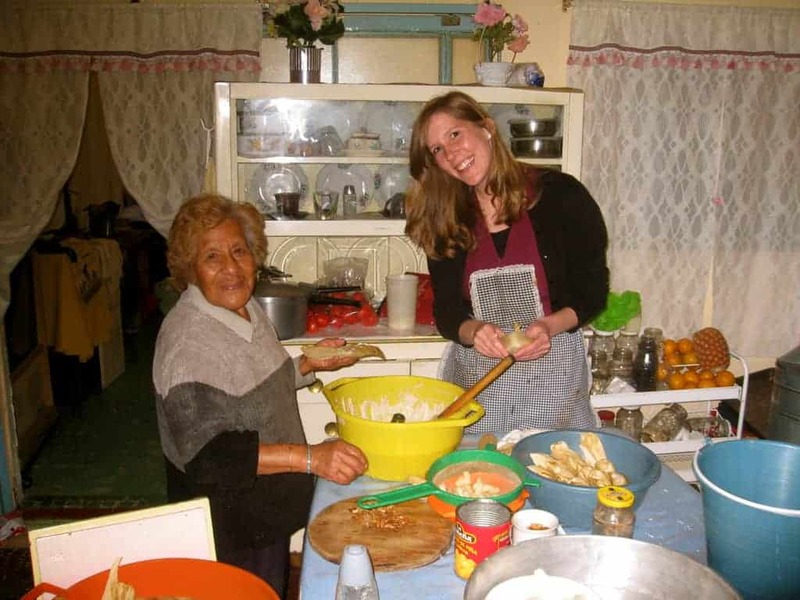 My husband and I were living in Puebla for a few months and became friends with this woman and her family. Her daughter was the secretary at the office building where we worked. The grandmother made incredible tamales! She made her masa dough completely from scratch, using dried white corn kernels and an ingredients called “cal” that I can’t find in the U.S. I expressed my desire to learn the ins and outs of authentic Mexican cooking, so the Grandma invited me over for a “tamalada” or Tamale making party. Tamales are a traditional Mexican dish made with a corn dough mixture (often maseca) that is filled with various meats. They are wrapped and cooked in corn husks or banana leaves! Below you will find a recipe for pork with a red sauce and chicken with a green sauce. Tamales can be quite a process–especially in the traditional Mexican way when you make several different fillings, all from scratch. We had a great time making pork tamales with red sauce, chicken tamales with green sauce, and bean and cheese tamales. Tamales are wrapped and cooked in a corn husk. The corn husk is not something that people typically you eat! After making your tamale, you unwrap the corn husk and remove the food from it. then enjoy your tamale with pico or other desired toppings! When I got back to the states I decided to make the tamale dough using Maseca, or masa harina (which you can find at most grocery stores in the Mexican food section). Making the dough for tamales is EASY and sooo delicious! First make the dough (see recipe below). Once you make the soft tamale dough, spread it onto corn husks. I use a piece of plastic wrap to spread it out into a thin layer. Remember that the corn husks are vital in cooking the tamales but they are NOT meant to be eaten with the tamales! Next, add you favorite tamale filling. I like to make my tamales with a few different fillings, just like we did in Mexico. I make the pork and red sauce from scratch, and then use shortcuts for the chicken and green sauce and bean and cheese. That way I get several different flavors, without spending too much time and energy. You could make yours all one flavor, if you’d rather. Now you’re ready to fold and cook them! Fold in one long side of the husk about 1/3 over dough and filling. Fold in the other long side, overlapping the first (like folding a business letter). Fold the bottom of the husk up. You could tear an extra corn husks into strings to tie around the tamales, if you want, but it’s not required. In Mexico we made the tamales pretty small, so that we had tons to send home and freeze for later. When I make these at home I’ll often make them much bigger because we like them with more filling in them. 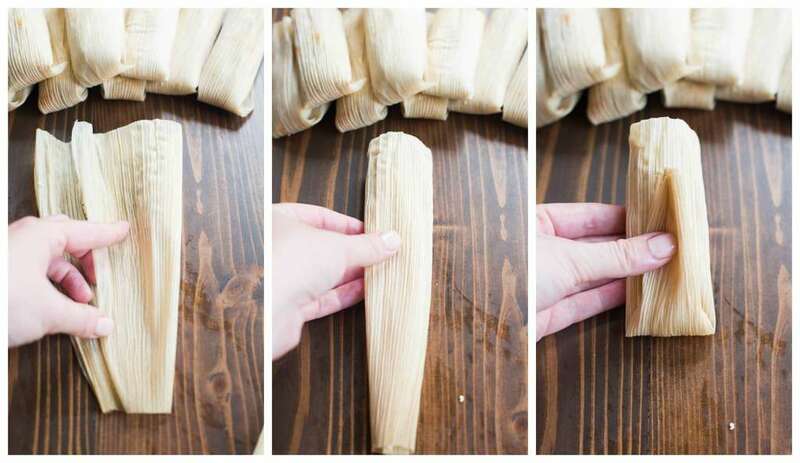 If your corn husks are small, you can overlap 2-3 together to make a bigger surface for spreading and folding the bigger tamales. You can make yours however big or small you want. Just cook them for a few extra minutes if you make them bigger then stated in the recipe. 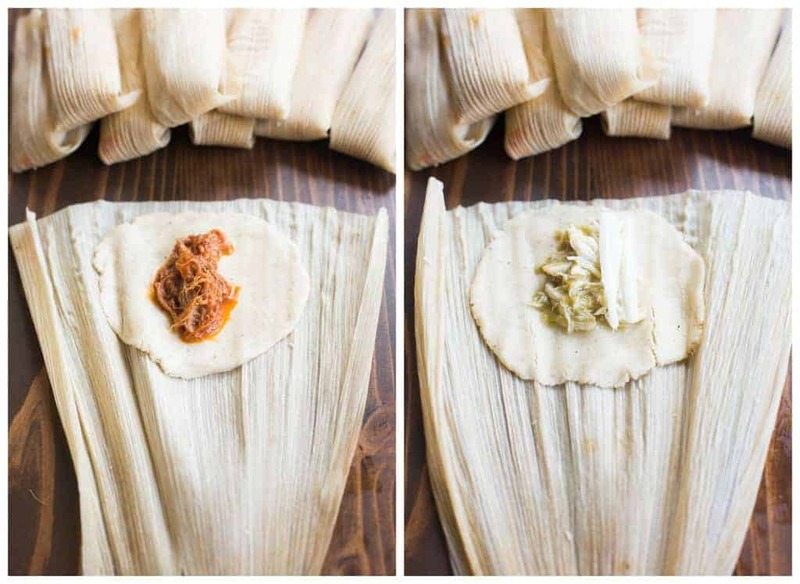 There are just two main steps to making homemade tamales. You can fill the tamales with whatever meat and sauce combination you like, or fill them with beans and cheese. I have provided the recipes for a pork and red sauce filling, and a chicken and green sauce filling. Tamale dough is really easy to make, thanks to our good friend, Maseca, that you should be able to find at your local grocery store, in the Mexican food aisle. The dough also contains lard. Yes, I know, it sounds disgusting, but it is what is authentically used in tamales and it makes for great tamale dough! I’ve found lard at Walmart, near the shortening. You could substitute vegetable shortening for lard, if you need to. Follow my instructions for making the dough. Then test if the masa tamale dough is ready by placing a tiny ball of dough into a glass of water— If the dough floats, it’s ready. If the dough sinks to the bottom of the glass then beat it for longer and add a little more broth. Test again. The dough should spread like creamy peanut butter and be slightly sticky. If you’re up for some authentic shredded pork and red sauce, follow the recipe below. The pork takes just a few minutes to throw together and cooks in the crock pot overnight. The homemade red sauce is also really simple and delicious. 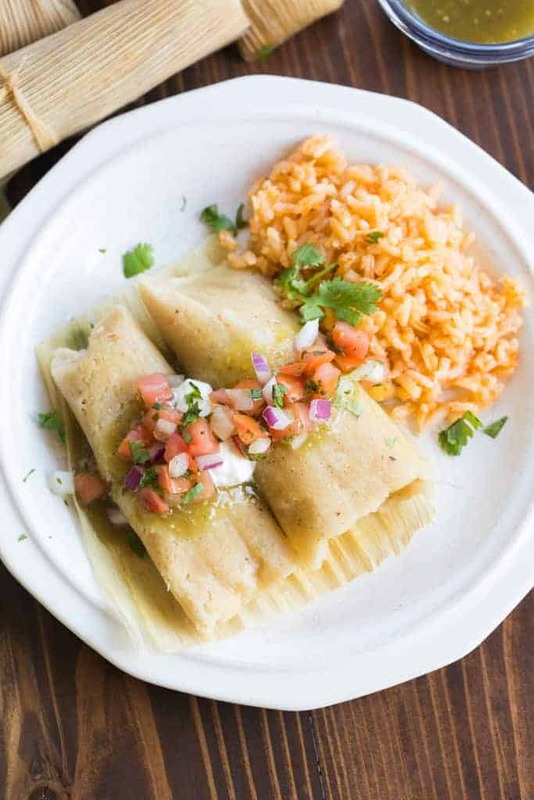 Or, if you’re looking for quicker filling ideas for your tamales, try the chicken and green sauce tamales recipe below. Just mix some shredded, cooked chicken (I use rotisserie) with a bottle of Herdez salsa verde. (I love the Herdez salsa brand and think it tastes just as good as homemade). You could also fill your tamales with a spoonful of refried beans and shredded cheese. 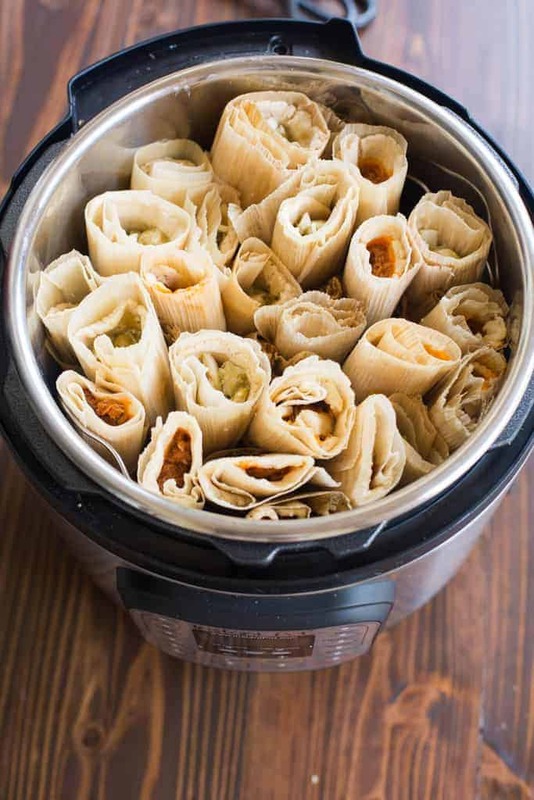 The tamales can be cooked in a steamer, or Instant Pot. Place them, open-end facing up, in the pot, packed just tightly enough to keep them all standing. You can test if the tamales are cooked completely by removing one from the pot and pulling the husk off. If the husk comes off easily and cleanly, they’re done! If not, you can steam them for another minute or two. Freeze your extra tamales and reheat them for later! Tamales make the BEST freezer meals for busy nights. 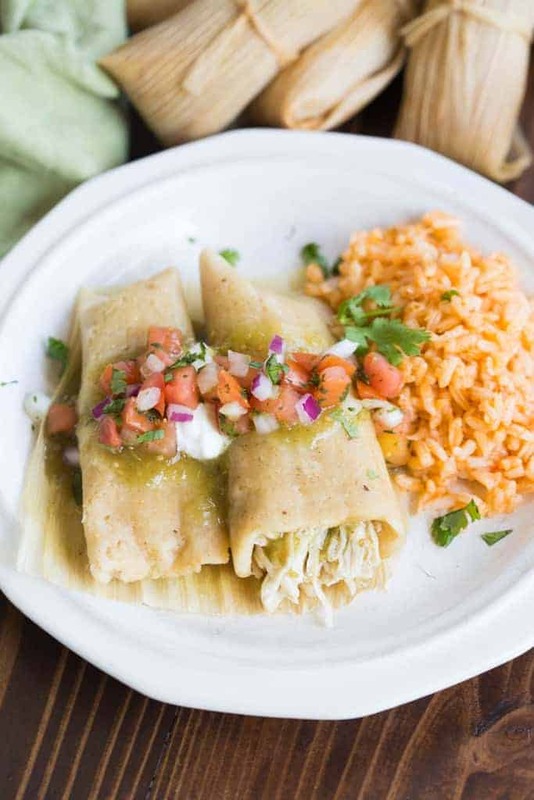 Serve them with a batch of Authentic Mexican Rice and you’ll be in heaven! To freeze them, allow the cooked tamales to cool completely, then stick them in a freezer ziplock bag. Freeze for up to 3 months. When you are ready to eat, wrap the tamales in a few dampened paper towels and place them on a plate. Microwave them for 2-3 minutes or until warmed through. The wet paper towels will help them “steam” as they are reheated. Be careful when unfolding them–they will be hot! 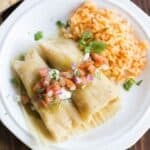 Recipe and instructions for Mexican tamales that you can steam or make in your instant pot. Pork and chicken tamales with red and green sauce. Soak the corn husks in a bowl of very hot or boiling water for at least 30 minutes. In a large bowl, use an electric mixer to beat the lard and 1 tablespoon of broth until fluffy, about 3-5 minutes. Combine the masa harina, baking powder, salt, cumin; stir into the lard mixture and beat well with an electric mixer. Add more broth as necessary to form a very soft dough. Beat on high speed for several minutes. To test if the masa tamale dough is ready, place a tiny ball of dough into a glass of water— If the dough floats, it’s ready. If the dough sinks to the bottom of the glass then beat it for longer and add a little more broth. Test again. It should spread like creamy peanut butter and be slightly sticky. Lay a corn husk, glossy side up, on the counter with the wide end at the top. Scoop a big rounded tablespoon of masa (or more if you want bigger tamales) and place it towards the top-half of the corn husk. 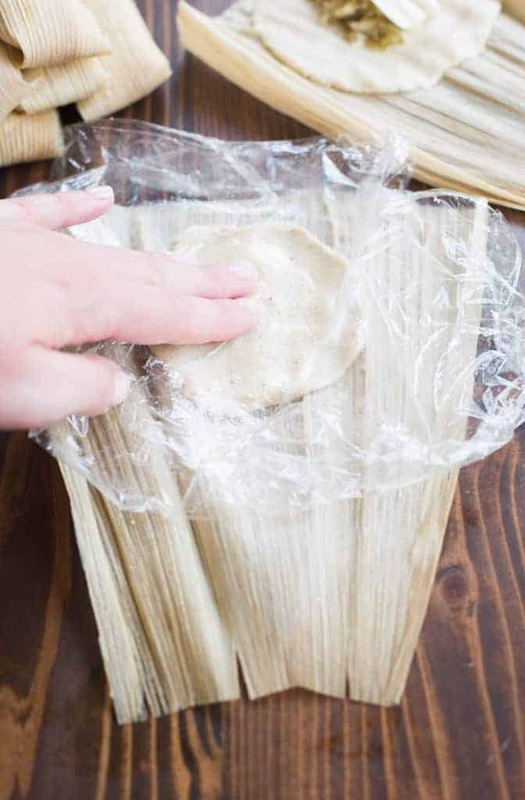 Lay a piece of plastic wrap over the dough and use your hands to press and spread the masa into a thin layer, about 1/4 inch thick, along the top half of the corn husk. Spoon a tablespoon of filling in a line down the center of the dough. Fold in one long side of the husk about 1/3 over dough and filling. Fold in the other long side, overlapping the first (like folding a business letter). Fold the bottom of the husk up. Add water to the bottom of your steamer or instant pot. (about 1 cup water, or enough to cover the bottom of the pot and not go above the wire rack. 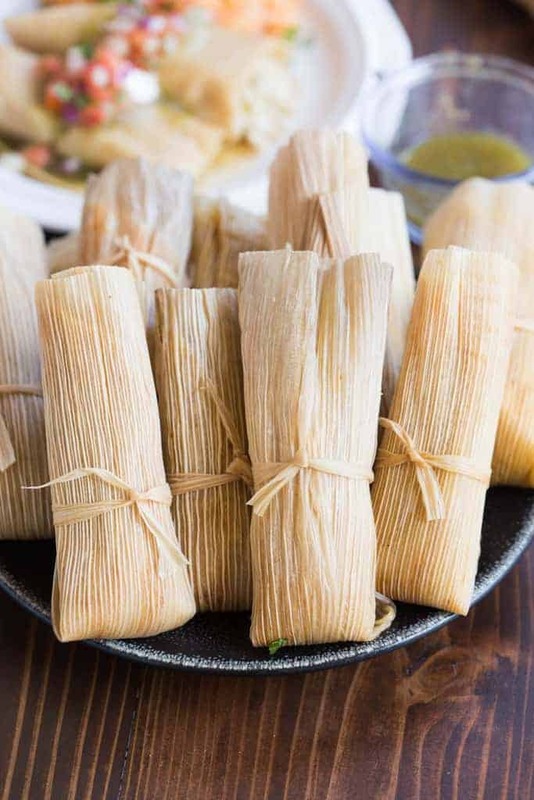 Place tamales on rack in steamer or instant pot, standing upright, with the folded end down and open end up. Don’t over-pack the pan, just pack them tightly enough to keep the tamales in an upright position. Steam for 50 minutes - 1 hour in the steamer, or, if using an Instant Pot, cook on Manual for 18-20 minutes, depending on how big you made the tamales. Allow pressure to naturally release for 10 minutes, and then quick release. To test if they’re done, remove one and try to pull the husk off. If it comes off easily and cleanly, they're done. Authentic Mexican tamales filled with Shredded Pork with Red Sauce. Place pork, onion, bay leaf, garlic, oregano, cumin and salt and pepper in a slow cooker. Cover the pork with water and cook on LOW for 8 hours or overnight. Meanwhile, make the red sauce. Use rubber gloves to remove the stems and seeds from the dried chiles while rinsing them under cold water. Place chiles in a saucepan with 2 cups of water. Simmer, uncovered, for 20 minutes, then remove from heat. Transfer the chiles and water to a blender. Add oregano, cumin, chili powder, onion powder, garlic and blend until smooth. Set aside. In the same saucepan you used to cook the chiles, add oil and cook over medium heat. Add flour and salt and stir for 1 minute. Strain the chile sauce from the blender and add it to the saucepan. Cook, stirring occasionally, for 10 minutes. Drain the cooked pork (reserve the broth for use in the tamale masa dough, if desired) and shred the meat with a fork. Add chile sauce to the meat, reserving 1/4 cup sauce, and stir in enough of the reserved broth to form a moist, spreadable mixture. Taste and adjust the seasoning if necessary. Authentic tamales filled with shredded chicken with a green sauce. Combine shredded chicken and salsa. Spoon filling onto tamale dough. Top with cheese. Roll and cook. Top cooked tamales with extra green salsa, and pico de gallo. Thank you LA !! !I have struggled for years with my masa.Your recipe cured that !!? I made four dozen on X- mas Eveand by the 26 there wasn’t even one left to give away!THANK YOU AND THE GRANDMA FROM MEXICO!!!! I purchased Tamales at the Mexican Market. I believe they are not cooked, and I do not have a steamer pot. Can they be cooked in the Microwave? Do they need to stand on end? Hi Catherine, I would read the packaging and try to figure out if they are cooked or not first. If they’re cooked then reheat them in the microwave inside wet paper towels. If they are raw than you’ll really need to cook them properly in a steamer pot or instant pot pressure cooker. Curious why you don’t use the IP to cook the pork?